Superb 18th C Flambe Glazed Sang De Boeuf Excellent Beauty Vase. 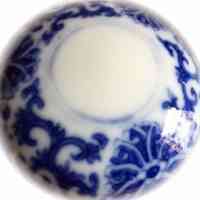 A beautiful blue and white porcelain pillow with lions design, Qing. 1 pair of Antique Straits Chinese/Peranakan/ Nyonya famille rose porcelain tea cups. Diameter 6.5 cm height 4.4 cm.